See this feature in action as part of our App features, start to finish series: Windows Store app UI, start to finish. For the complete list of controls that WinJS provides, see the Controls list. Download the latest version from Get WinJS and copy it to the directory for your app or website. Add WinJS CSS and script references to each page of your app or website that uses WinJS features. This example shows what these reference look like for an app that has its WinJS files in its root directory. Unlike HTML controls, WinJS controls don't have dedicated markup elements: you can't create a Rating control by adding a <rating /> element, for example. To add a WinJS control, you create a div element and use the data-win-control attribute to specify the type of control you want. To add a Rating control, you set the attribute to "WinJS.UI.Rating". The next set of examples show you how to add a WinJS control to a project created with the Blank Application template. It's easier to follow along if you create a new Blank Application project. From the Start Page tab, click New Project. The New Project dialog box opens. In the center pane, pick the Blank Application project template. In the Name text box, enter a name for your project. Click OK to create the project. This will take a moment. Create a div element where you want to place the control. Set its data-win-control attribute to the fully qualified name of the control you want to create. This example creates a Rating control on the app's start page (the default.html file). If you aren't using the Blank Application template or if you're adding the control to a page that you created yourself, you might need to add a call to WinJS.UI.processAll. If you added the control to your app's home page (which is usually the default.html file), add a call to WinJS.UI.processAll in your onactivated event handler, as shown in the previous example. If you added the control to a Page control, you don't need to add a call to WinJS.UI.processAll because the Page control does that for you automatically. If you added the control to another page that is not your app's home page, handle the DOMContentLoaded event and use the handler to call WinJS.UI.processAll. The WinJS.UI.processAll function processes the document and activates any WinJS controls that you've declared in markup. When you run the app, the Rating control appears where you positioned the div host element. This example sets the maxRating of a Rating control to 10. The next example sets two properties of the Rating control. To find out if a property is supported by a given WinJS control, see its reference page. You can also set the properties of a WinJS control programmatically. To access the control in code, retrieve the host element and then use its winControl property to retrieve the control. In the previous examples, the host element of the Rating control is "ratingControlHost". The WinJS.UI.processAll returns a WinJS.Promise object that you can use to call a function when the WinJS.UI.processAll method completes. Here the example defines a completion function that retrieves the control and sets its averageRating to 3. The next section describes how to add event listeners to a WinJS control. Just like with HTML controls, the preferred way to attach event listeners for a WinJS control is to use the addEventListener function. Retrieving a WinJS control is a bit different than retrieving an HTML control, however. Call the control's addEventListener function and specify an event and an event handler. The next example shows how to handle the change event of a Rating control. In your HTML file, add a paragraph and give it an ID of "outputParagraph". Your event listener will output to this paragraph. When you run the app and change the rating, it creates a list of event information properties and values. In your markup, create the element that will host your control. In your code (preferably in your DOMContentLoaded event handler), retrieve the host element. There's no need to call WinJS.UI.processAll—you only need to call WinJS.UI.processAll when you create a WinJS control in markup. You learned how to create WinJS controls, how to set their properties, and how to attach event handlers. 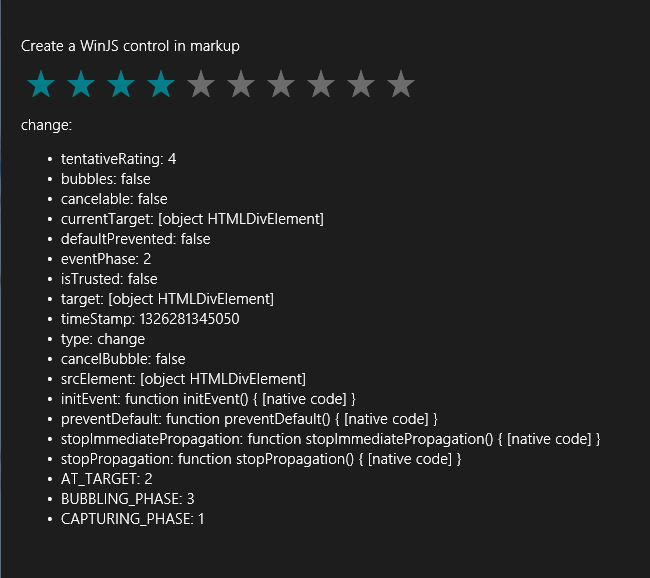 For live code examples of nearly every WinJS control and an online editor, see try.buildwinjs.com.